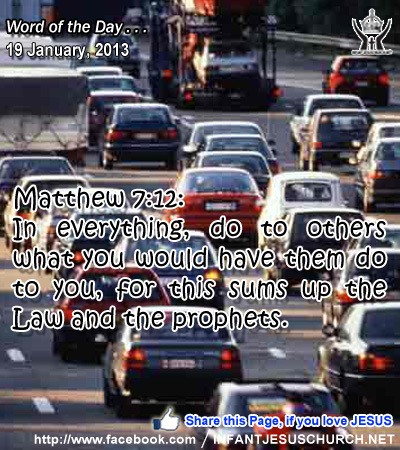 Matthew 7:12: In everything, do to others what you would have them do to you, for this sums up the Law and the prophets. Heavenly Father, you have blessed us with so many rich and wonderful gifts. We can never ever adequately express to you the thanks you deserve. One thing we want you to know, dear Father, is that we especially appreciate the way you have treated us with grace and not with justice or judgment. Give us the power to do the same with the people our life touches this week. In Infant Jesus' name we pray. Amen. 13He went out again beside the sea; and all the crowd gathered about him, and he taught them. 14And as he passed on, he saw Levi the son of Alphaeus sitting at the tax office, and he said to him, "Follow me." And he rose and followed him. 15And as he sat at table in his house, many tax collectors and sinners were sitting with Jesus and his disciples; for there were many who followed him. 16And the scribes of the Pharisees, when they saw that he was eating with sinners and tax collectors, said to his disciples, "Why does he eat with tax collectors and sinners?" 17And when Jesus heard it, he said to them, "Those who are well have no need of a physician, but those who are sick; I came not to call the righteous, but sinners." When the Pharisees challenged his unorthodox performance in eating with public sinners, Jesus' defense was quite simple. A doctor doesn't need to visit healthy people; in its place he goes to those who are sick. Jesus similarly sought out those in the greatest need. A true physician looks for healing of the whole person - body, mind, and spirit. Jesus came as the divine physician and good shepherd to care for his people and to restore them to wholeness of life. The orthodox were so worried with their own practice of religion that they deserted to help the very people who needed care. Their religion was self-centered because they didn't want to have anything to do with people not like themselves. Jesus stated his mission in clear terms: I came not to call the righteous, although to call sinners. Paradoxically the orthodox were as disadvantaged as those they despised. All have sinned and fall short of the glory of God. The Lord fills us with his grace and compassion. And he wants us, in turn, to seek the good of our neighbors, including the unlikeable and the trouble-maker by showing them the same compassion and mercy which we have received. Do we thank the Lord for the huge kindness and mercy he has shown to us? Loving Infant Jesus, let us now come to you: Our hearts are cold; Lord, warm them with your selfless love. Our hearts are sinful; purify them with your precious blood. Our hearts are weak; make stronger them with your joyous Spirit. Our hearts are empty; fill them with your divine presence. Lord Infant Jesus, our hearts are yours; possess them always and only for yourself.